Dr. Bhume Bhumiratana (ดร. ภูมิ ภูมิรัตน) is a researcher, educator and practitioner in cybersecurity. He received his PhD from the University of California, Davis in 2009, specializing in application security design, privacy design and implementation, and modern cryptography. His consulting experience includes serving as a principal consultant at a leading IT company in Thailand, where he created a new business unit focusing on security consulting solutions. He built and managed a team of cybersecurity experts specializing in products in the area of advanced authentication technology, machine learning and big-data, and cybersecurity. Bhume is also a technology advisor to SEC Thailand, providing knowledge and consultation to all technology related issues the SEC has to deal with. This varies from internal technology projects to cybersecurity, IT (risk) management, and more. — This is is the first time Bhume is speaking at an international event! Prinn began his career as an analyst in the corporate finance sector in London, actively promoting UK investments into Asean as Vice Chairman of the Asean-UK Business Forum (AUBF). He then joined Deutsche Bank Tisco Securities as Vice President when he returned back to Thailand and was appointed as head of sales in 2007 by the CLSA — where he was ranked number one in institutional sales by the AsiaMoney Poll. ASCO (Association of Thai Securities Companies). He is also on the executive committees of the New Economy Academy (Ministry of Commerce) and Foundation on Anti-Corruption of Thailand (FACT). — Prinn recently did an interview with Money Channel, where he told some more about who he is, what he does, and what you can expect at Beyond Blocks. Watch the full video below (For our Thai-speaking viewers)! Thammarak Moenjak is currently Director of the Financial Institutions Strategy Department at the Bank of Thailand (BOT). Prior to this position, he was in Office of Corporate Strategy, working as Project Coordinator of the BOT’s wholesale central bank digital currency (CBDC) proof-of-concept initiative, Project Inthanon, as well as on the formulation of the BOT’s stance on crypto assets. After 13 years at the Bank of Thailand, where he could rotate and get deeply involved with various key aspects of central banking, including modelling and forecasting, monetary policy strategy, reserves management, financial stability assessment, and corporate strategy, he wrote the book Central Banking: Theory and Practice in Sustaining Monetary and Financial Stability, that got endorsed by many great thinkers from central banking and academic circles all over the world. In 2008–2009, Thammarak was sent by the Bank of Thailand, and contracted as an IMF expert, to help the Reserve Bank of Fiji develop its own macro-econometric model for use in the conduct of monetary policy. Kaweewut is currently the head of ‘10X’, the innovation team at SCB, where he is tasked to find the next high growth business opportunities. Prior to SCB, he led the innovation and VC team at PTT, the largest conglomerate in Thailand. He was leading the team to build new business ideas and prototypes, while finding synergy between PTT and other startups around the world. He received his MBA at Stanford University and was trained Design Thinking at Stanford. Kaweewut also teaches Design Thinking at Chulalongkorn University. We caught up with Bhume and asked him a few questions leading up to the conference. At Summit Bangkok, we’ll be doing exclusive video interviews on-scene, and you’ll be able to view them on our YouTube shortly after the event. 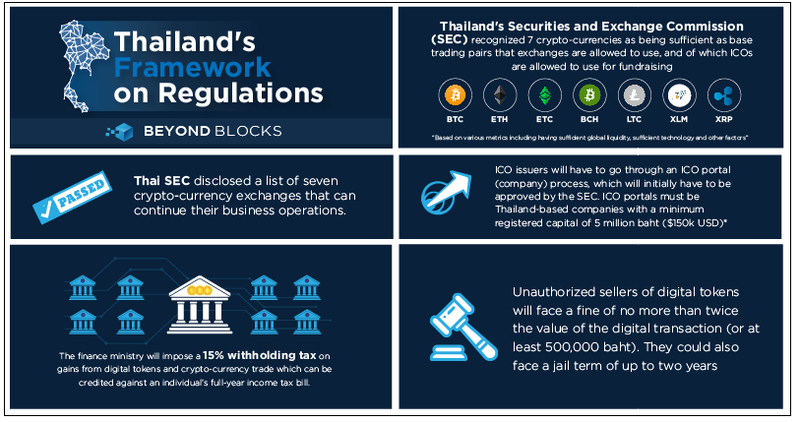 Can you tell us more about the unique Thai regulatory framework? This framework allows the SEC to define the subcategory of a digital token (such as investment token and utility token) and regulate business behaviour accordingly. Can you elaborate some more on all of the requirements? The law requires anyone that’s creating a digital token intended to distribute to the public to have to register and get permission from SEC first. This is to protect investors. The SEC requires that the token issuer gets advice/support from a registered business, known as ‘ICO Portal’, with relevant experience and enough knowledge of regulation. ICO Portal serves as an advisor to help the token issuer review and create a regulatory compliant ICO crowd-funding process, helping the SEC deal with the diverse type of businesses. Businesses that want to transact using tokens, may require a license. Anyone that solicits business (including fundraising) from a person in Thailand requires a license (or in the case of ICO; permission). There are a set number of exemptions that the SEC has granted. What got you interested in blockchain at first, and what made you decide to take on this role later (on)? I used to teach cryptography, and I’ve known about Bitcoin and blockchain since its inception. It’s an interesting technology, and I used to just teach it as a subject in my classes many years back when I was a lecturer. Recently, I’ve got involved with this topic a lot because a lot of people became interested, so I was asked by many people to give a speech or teach them about it. I was already an advisor to the SEC (on technology, innovation and Cybersecurity) and blockchain/digital assets just sort of came up. My interest continued to grow, as to understand blockchain, one must also learn a variety of other things, such as economics, valuation of tokens and the business models surrounding it. Even more; social impact, philosophy, mathematics, politics, policy, rules, regulations, etc… It’s a very rapidly advancing and evolving area, which makes it very interesting. What’s the ultimate goal to achieve, regarding the work you’re doing with the SEC? My goal is to help the SEC adapt itself in the increasingly digital market, to help it become a progressive and digital regulator that understands technology, business and the changing nature of innovation and disruption. 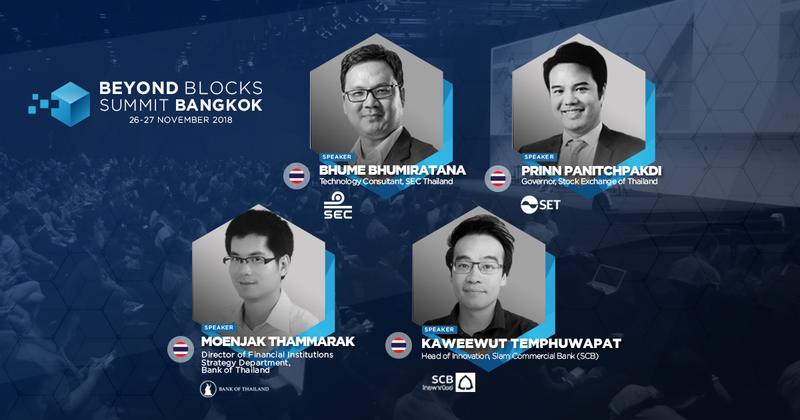 As you mentioned that blockchain is at least one of the most talked technologies in the IT industry in Thailand; what do you potentially see happening here in the next year? There are a lot of interesting and exciting developments happening in all sectors. We’ll begin to see many applications being developed and going into production in 2019 and beyond. Lots and lots of things I want to talk about, but can’t yet! But, for sure we will see an economically and socially impactful application of blockchain in Thailand very soon! In what sector do you think blockchain can add the most value? Financial for sure. Supply chain and logistics is also very popular. Real estate is also an area where interest is growing fast. It can have a huge impact.